52 • RV PRO • November 2018 rv-pro.com O P E N H O U S E C O V E R A G E interiors of many RVs. But the 2019 models broadly make use of lighter interiors. But to a person, general managers and product designers alike assure dealers that they are going toward lighter interiors, but not so much as to give a sterile, hospital-like feel. The first new nameplate introduced during a Sunday night exclusive invitation-only sneak peak, Travel Lite's Evoke, featured a light interior designed to emulate New York City apartment chic, according to Travel Lite President Dustin Johns. Several Jayco models, including the Eagle 319MLOK fifth wheel, sported lighter interiors called Modern Farmhouse accented by darker rustic hardwood tabletops. Eagle's refrigerator even had inserts that matched the distressed Modern Farmhouse wood. First-Time RV Makers Flourish at Show Perhaps reflecting the overall strength of the RV industry, there were a number of RV manufacturers displaying their wares for the first time at Open House this year, including tent trailers from Crux Expedition Trailers (Colorado), Class B motorhomes from Regency RV (Texas), truck campers from Rugged Mountain (Idaho) and Class B's and specialty units from 5 Mars (Canada). In addition to those out-of-towners, there was one local company, Shipshewana new startup Braxton Creek RV, which builds stick-and-tin travel trailers. Braxton Creek prides itself on its fit and finish, thanks to a mature workforce that is not focused on rushing through to the next unit, according to Don Dorton, vice president of sales and marketing. The company stresses its motto, "A passion for doing things right the first time, every time." Dorton says the company's founders have more than 150 years' combined experience in the RV industry and stress tra- dition in everything they do. For example, they concentrate on suppliers who build their products in the U.S. "We partner with vendors who are here for the long haul and build quality products," Dorton says. He says Braxton Creek is proud of the progress it's made in its inaugural year. Its 25-member dealer body is primarily based in the Midwest. However, with the prime exposure the company garnered during its first Open House, it expects to expand that in the coming months. Dorton says that by the end of this year, the company expects to be adding fifth wheels to its lineup. Pet-Friendly Features Proliferate A number of trailers were showing off new pet-friendly features for 2019. Keystone's Outback 300ML model ups the ante from stan- dard pet-safe fare to include a portable kennel under the bed. Pet-friendly features run throughout the Outback line. In the Highland Ridge line, pet-friendly features include pull-out food dishes, designed animal sleeping areas with bed- ding, no carpet in most models, no floor registers and minimal cloth materials in seating/lounging areas. The Starcraft Telluride fifth wheel has eliminated carpet and has added pet water and food dishes beneath the stove in the kitchen. Winnebago has a variety of pet-related features in its units. The Vita has special hooks on the running boards that are perfect for attaching a dog leash. The Intent has a pet leash tie-down on the patio side near the entrance door of the coach. And the Travato 59KL and 59GL have an energy system that monitors the battery levels. If the battery gets too low, the engine will run to recharge the lithium battery and keep the air conditioner running. This is especially helpful if the owners are away from their coach and they want to keep their pet cool. 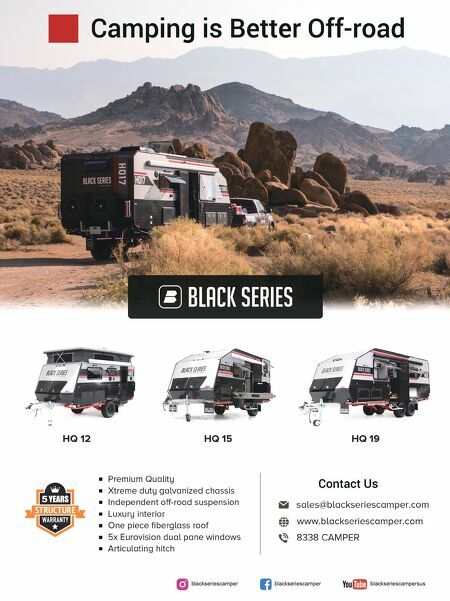 A number of RV makers highlighted pet-friendly features in their models this year, including Highland Ridge, Keystone, Starcraft and Winnebago. At its display, Riverside RV showcased a dog-house-sized trailer (pictured) complete with dog bowls at the front. 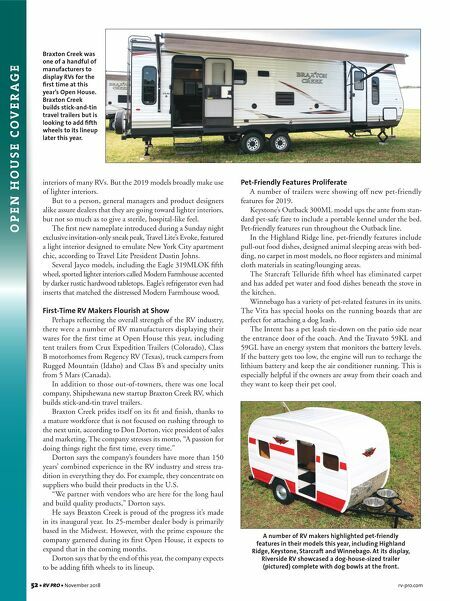 Braxton Creek was one of a handful of manufacturers to display RVs for the first time at this year's Open House. Braxton Creek builds stick-and-tin travel trailers but is looking to add fifth wheels to its lineup later this year.